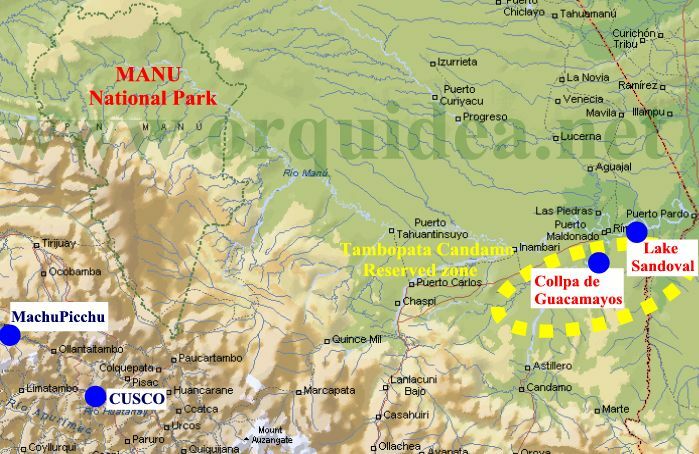 Manu National Park is a biosphere reserve located in Madre de Dios and Cuzco. Before becoming an area protected by the Peruvian government, the Manu National Park was conserved thanks to its inaccesibility. The park remains fairly inaccessible by road to this day. 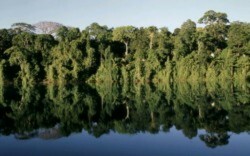 In 1977, UNESCO recognised it as a Reserve of Biosphere and in 1987, it was pronounced as World Heritage Site. It is the largest National Park in Peru, covering an area of 15,328 km�. The park protects all the ecological zones that exist in the Amazon Basin, covering an altitudinal gradient between 150 and 4200 meters above sea level. Because of this variety, its biodiversity is one of the most appreciated in the world. Overall, more than 15,000 species of plants are found in the park, and up to 250 varieties of trees have been found in a single hectare. The reserve is a destination for birdwatchers from all over the world. This is the least populated territory in Peru, with only 600,000 people living in its 80,000 Km2 (30,880 sq miles) of jungle area. Its capital is a riverside city known as Puerto Maldonado with 25,000 inhabitants. Near Puerto Maldonado there are several attractions such as the Sandoval and Valencia lakes, next to the Bolivian border (by river, 4 hours from the city). These wonderful places give the tourist the opportunity to fish, be close to nature, and be in contact with native communities. The Manu, Tambopata-Candamo and Pampas de Heath reserves cover 3'500,000 jungle hectares (8'645,000 acres), the largest and richest bio-diversity of the world. They keep unique flora and fauna species, impossible to find elsewhere, including 2,500 flower varieties, more than 1,000 birds (10% of the world's species,) 900 butterfly species and more than 20 kinds of monkeys.